How much does it cost to build a Lean-to conservatory? How much does it cost to build a Lean-to conservatory? A simple question – “How much does it cost to build a lean to conservatory?”, but the answer is a little less simple. Not all conservatories are the same, and choosing what’s right for you and your home will affect the cost. 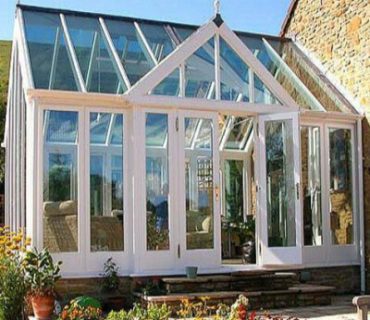 Our easy to follow, down-to-earth article takes you through all the facts and figures that you need to help you make the best decision about your lean to conservatory, starting with the features, benefits and finishing with the costs. In the first, the glass (or often polycarbonate for the roof) will run from ceiling to floor. In the second, infill panels or low level brickwork (often called dwarf walls) will run from the floor to a certain height (2 or 3 feet), after which the glazing continues to ceiling height. In the first of this particular feature, the roof section is glazed. 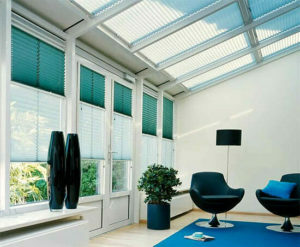 Either with fully sealed double glazed panels or polycarbonate sheets. Poly-carbonate sheets are popular because of their light weight and lower fitting cost when compared to glass. The well-known rectangular look of a lean-to has undergone some development. An increasingly popular feature of the standard lean-to conservatory is the use of a veranda overhang. This “veranda conservatory” is where the sloped glazed roofing section is extended further past the wall line of the front of the conservatory itself in order to create a protected area directly outside the conservatory doors. The big plus-point of this sheltered area comes into its own when you or your guests need protecting from the Great British (wet) summer weather. In the second of this feature, many homeowners are now opting for a solid roof. The reasons are two-fold. Primarily due to a failure of an existing conservatory roof or secondly to eliminate glare and overheating, which can be a problem for some lean-to rooms. In addition, developments in frame materials have led to low maintenance uPVC & aluminium conservatory structures. In terms of glazing development, this has led to “solar control”, toughened or laminated safety glazing and self-cleaning glass. All of which make the “lean-to conservatory life” much more enjoyable. But, as with every silver lining, there is a cloud – all these extras will impact the cost. 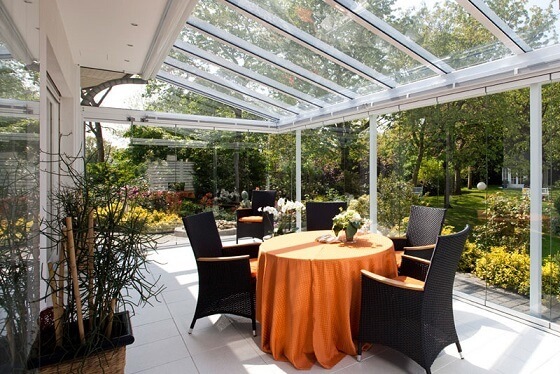 Leaving aside the pleasure of having a living space that links indoors and outdoors, makes the best of the sun and gives a light open area in which to relax, regardless of the weather, there are two key benefits to choosing a lean to conservatory. Whilst only your local planning department can absolutely state that there won’t be a requirement for planning permission for your project, in most cases where it follows a set of guidelines, an average sized lean to conservatory won’t require planning permission because it can be classed as a ‘permitted development’. ** see the UK planning portal guide here – always check with your local planning authority before starting any construction. What does it cost to build a lean to conservatory? There are always going to be some levels of differences between suppliers when it comes to materials, labour charges, guarantees etc. Most reputable suppliers offer a free quotation service and we can arrange that for you here. Supply only retailers can be checked out online to see what kind of reviews they’ve received. 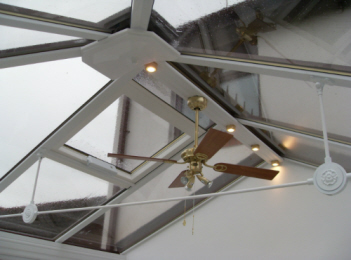 Other factors to consider when costing your lean-to conservatory include items such as – how many power sockets and light switches you require? Whether you want underfloor heating or radiators, maybe even air conditioning or a ceiling fan. Here are some rule-of-thumb figures to help you when you are considering the price of your lean-to conservatory. Every conservatory needs a base. If you have to dig foundations and lay a base on top of them, then it will cost more than a steel frame base – which will start in the region of £1,000 to £1,500 for a small to medium lean-to conservatory. 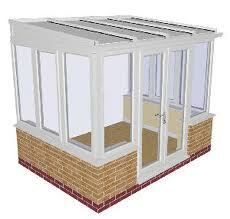 The supply-only cost for decent quality, small uPVC full-glass sided lean-to, begin at around £2,000 to £2,500. This is with a polycarbonate roof & no base. It’s important to consider the costs of ‘knocking-through’ from your existing home and creating the doorway into the conservatory if you need to do so. 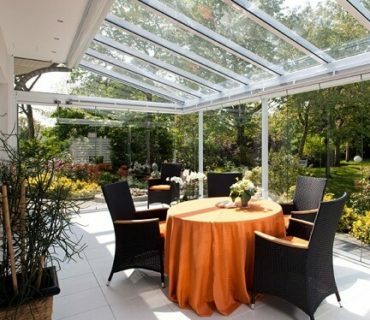 OK, so here are the 7 biggest influencing factors on the cost of lean-to conservatories. Size – bigger is more expensive (no surprises there!) – size can lead to other issues & expenses such as planning permission requirements. Base – pre-fabricated bases will usually work out cheaper than having to dig traditional footings for the room. Roof – polycarbonate is probably the lowest cost option. Double glazed or tiled roofs will cost considerably more. Walls – dwarf walls push up the overall price of the job. Glazing & Doors – the energy rating of the glass and the type of doors you fit will have a definite impact on pricing. The company quoting for the work – there can be significant differences between one contractors’ quote and another. Get at least 4 different quotes from independent companies (go here to let us arrange that for you). What are Lean-to Conservatory Prices in 2017? To use double glazed roofing in place of poly-carbonate, you should expect to add from £700 to £1,500 to the cost (depending on the quality & dimensions required). The usual lead-time would be from 6 to 8 weeks. Unless you are buying “off the shelf” supply only which can be delivered quite quickly. How long does it take to install a lean-to conservatory? You should allow 3 to 4 weeks from start to finish. Some can be done more quickly, but check with your installer. Unless the person who told you is the local planning officer, I would suggest you get an official opinion. It’s true that many conservatories can be built without the need to get planning permission, but there are some rules to follow. Learn more here. How much deposit should I pay upon ordering? It’s understandable that both you and the installer want to be comfortable with the amount of initial deposit. If the installer is asking for a very high proportion (over 50%) then you should ask yourself why. It’s customary to be asked for at least 25 to 30% up front. Ensure the company you are considering offer insurance backed deposit guarantees. When should I pay the balance of the cost? Only when you are completely satisfied that the work is completed to the terms of your contract. Will building a lean-to conservatory make my house worth more? There are a number of reputable sources, including financial institutions that have estimated that a good quality conservatory can add around 7% to the resale value of a property.